If you’re wondering how I can help you with respect to getting started with the oils, please know this: the first thing I’m here to help you with is saying yes to That feeling. It may not make sense to your brain but what I teach is that the heart doesn’t always give you the bigger picture until after you listen to it. Because I’ve learned that’s the intention of the heart; To mold and shape you into a person that trusts it, honours it and cares deeply for others through living, leading and serving in the way it wants you to. why your heart likely guided you here. And you being guided here makes perfect sense because whether you’re craving a home that is purified from toxic and harmful products, a body that feels good not just some days, but every day, a family that doesn't just survive but thrives or a spirit that is deeply attuned to it’s grandeur purpose, essential oils can help. Also check out and bookmark this helpful guide I created with 50 ways to use the top 10 oils. From replacing toxic household cleaners, to purifying the air with DoTERRA’s signature immunity blend, to reaching for a powerful tool for your kids to breathe deeper… the possibilities are endless. Also make sure you click here and join my free oil cove on Facebook for daily tips and recipes. Check out this free guide I created for you. Well - you can watch my Essential Oils 101 Masterclass for families (it's goooooood) for all the details you'll really want to pay attention to. If you prefer to read, keep going. Let’s chat for a sec about the business world and how trends work. Think about the Cadillac brands at the forefront of your favourite industry. The Chanel purse, the Ugg boot, the Starbucks coffee. They stand out. Why is that and why are they at the top while everyone else shuffles to understand and compete? It's because innovators look into the depth of how to truly solve a problem and they serve their consumer on a level that no one else can match. The copycat brands who attempt to duplicate the greatness of another, in an attempt to make a quick buck, tend to struggle. I believe it's important for you to know that DoTERRA is the Cadillac. And here’s why. The founding executives sat down and set the intention to create this business in the way they were being guided to create it - which always leads to the most impactful results for people like you because when you lead in this way you're guided to build a business that is congruent to and in alignment with what the world needs. The model that came to them intuitively was network marketing. They trusted in the guidance they were receiving and they took immediate action on the execution of their business plan. This is the type of integrity that I admire so deeply in life and leadership. What happened next was massive. They grew to be the largest essential oil company in the world, their quality is unmatched (I’ll get to that in a sec) they are the network marketing company with the highest retention rate (this shows their commitment to serving you and giving their consumers what they need on a soul level for health + healing) and they are setting a benchmark for leadership + social impact in the business world as a whole. And when it comes to the sourcing of their oils, this is where you will really want to pay attention. The heart only guides people to truth health and true healing, that we know for sure. And when it comes to leveraging essential oils for the support of increased energy, vitality and flow within your home - quality is everything. DoTERRA sources indigenously meaning they source out the part of the earth that, based on factors such as climate and soil condition, will produce the highest quality essential oil. Essentially they pick their plants where they are thriving most. For example, DoTERRA's Spikenard is sourced from the Himalayan mountains and Petitgrain is sourced from Paraguay. DōTERRA is also the only essential oil company that is completely transparent about what is inside each and every bottle. Their Source to You site provides Quality Report testing results associated with each individual bottle that you purchase so you can fully understand where your oils are coming from and the unmatched quality. This shows the Cadillac intention behind their vision to source the words best oils so that you and your family can benefit from only the most pure, potent, and effective plants. PS: if scientific research is more your jam, there are thousands of independently conducted studies on the benefits of pure essential oils for health and DoTERRA has a whole website devoted to the topic here. Service is at the heart of DoTERRA’s business plan. While the temptation for a company as large as DoTERRA may be to buy large plots of land and mass produce oils, DoTERRA places great value on the expert knowledge of local farmers—many of whom have nurtured essential oil plants for generations. DoTERRA leverages their expertise into a Global Botanical Network and, in so doing, responsibly supports thousands of jobs around the world. To learn more about their co-impact sourcing initiatives and other global projects you can read more on their website here. It means that your heart does know best and is guiding you to the Cadillac of support systems out there for a reason. I can pretty much guarantee that if you take your oil education and use seriously, the oils will be there to support you in actualizing what your heart is telling you she’s ready for. Enrolling as a customer is for anyone looking to scale up with respect to how they treat and seek to continually enhance their body/mind/spirit. Also, before I give you step by step guidance on how to enroll, if you’re interested in building a doTERRA business click here. About 70% of people who join doTERRA do so for the oils. But a small percentage of people want to share and educate others. If that's you, learn more by clicking here. Oils have helped me access a greater sense of intention. Sounds a bit weird but I know this: intention is now present when I use my oils daily, when I reach for my bottle of Balance in the middle of my two tiny humans having meltdowns, when I have only an hour to bust out some work and need to shift quickly and intentionally into a productive and creative head space. It's all intention. And if I'm constantly moving in the direction of intention, I show up better as a mom, wife, daughter, friend and as a leader. SO - LET’S DO THIS. And I’m excited for you. Step 4 --> Fill out the top of the application with your personal information…address, email etc. 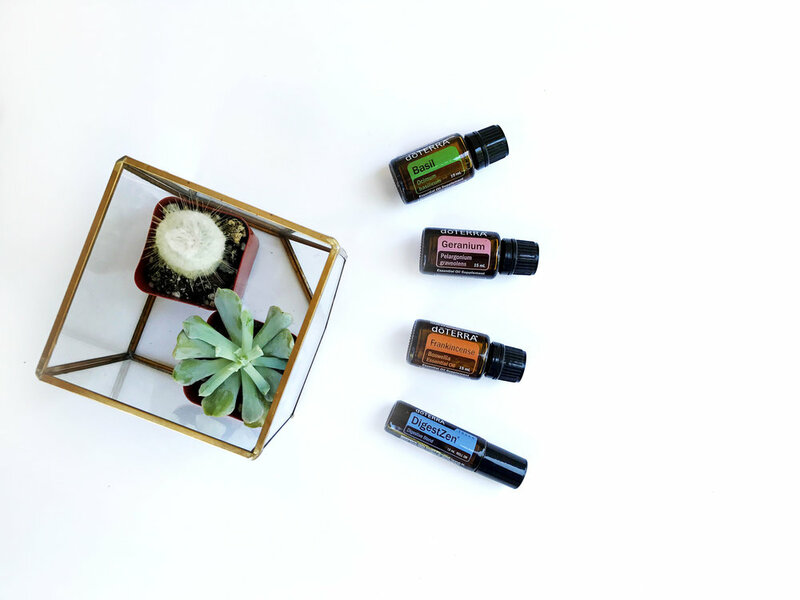 Step 6 --> Select either the enrolment kit you would like (and waive the joining fee) or choose your single oils and add your 'Welcome Introductory Packet for $35 (this is the 1-year wholesale membership that gets you 25% any oils for a year). Tip: Make sure to add a bottle of 'fractionated coconut oil' to your order so you can start to create blends and apply the oils safely to your body. Step 7: Select continue and you will be directed to the next page to input your credit card details. I will email you a welcome package after that!